Last week in the video section we were introduced to the lyrical style of Richie Branson with the music video featuring his song, The Cold Republic. Having looked at many player generated videos featuring or highlighting SWTOR, Richie and the guys helping him produce the videos have created some very creatively unique music videos. This past week I got in touch with Richie and setup an informal Q&A. This is hopefully going to be a reoccurring section for HoloNet Links. It is my priority when writing to showcase the community. The community really is the “backbone” of the game and the environment surrounding it. So if I get a chance to interview someone doing something creative in the community, I’m going to try my best to do so. Now let’s meet this week’s community spotlight, Richie Branson. Can you tell our readers a bit about you and how you got into writing and singing lyrics about SWTOR? Have you written lyrics for other games? Sure, I’m a hip-hop artist/producer from the great state of Texas. As a producer, I’ve worked with a variety of major labels including Def Jam Recordings and Sony Music Entertainment. I am the co-founder of a music production company known as “Red Prodigy”. We’ve worked with some pretty dope artists such as Rick Ross, Bun B, Bone, and Slim Thug. As an artist, I’ve been rapping for a little over a year. I actually managed to score a recording deal with an executive at Universal Republic records (home of Nikki Minaj, Jessie J, Drake, etc.) through his imprint Tutone Entertainment. I’m grateful for the opportunities I’ve received through making music, including being able to go on tour with DMX. To be honest, I’ve always been a nerdy guy who likes anime and videogames. After struggling to “fit in” with the people in my environment, I decided to accept it and make music based on my personal interests. I’ve been going in heavy on the video game and anime raps lately. Honestly, I never really intended on making any music about SWTOR until I heard the game’s main theme playing over the character select screen. I was so inspired I logged off the game and immediately made a beat sampling the theme music. After that, the rest was history! Aside from the Cold Republic Episode I mixtape, I’ve got a mixtape based on Mobile Suit Gundam coming out soon called “The Wing Zero EP”. What are some of your musical influences? Are they the same as what you listen to regularly? I have a pretty open-minded taste in music. I jam everything from Frank Sinatra to Isaac Hayes to Rick Ross to Mozart. If I had to pick a chief musical influence I’d have to say Mozart. Seeing “Amadeus” in middle school was the reason I decided to make music. The next year, I joined band as a saxophonist and have been into music ever since. Who helps you with the videos? Is it a team effort or does each person do their own part? All of my in-game music videos are created by Riley Hastings over at the Vancouver Film School. He runs his youtube channel SWTORLegit and is now a video editor for SWTORExtreme’s youtube channel as well. He’s a beast with the machinima work. I send him the music and he makes magic happen. He’s truly awesome to work with! 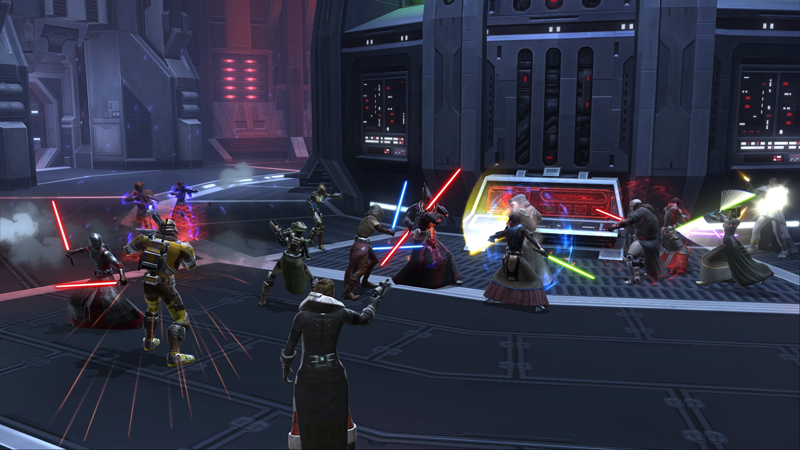 How have you liked SWTOR so far? What is your main character, class and advance class? I absolutely love SWTOR, especially the story. As a former EVE online player, I never was a fan of “theme park” MMORPGs like WoW and such, but SWTOR has definitely changed my perspective. My main character is a level 40 Sith Assassin on the Ven Zallow server, named “Branson”. He’s a beast at Huttball. Can you give us any hints on the next videos/songs inspired by the game? There will definitely be an Episode II of the Cold Republic in the works. I can’t say too much yet, except that I’ve finished the first song: “Frog-Dog the Bounty Hunter”. Episode II will also have some more collaboration with other awesome videogame-influenced musicians. Where can fans of your music and videos follow you or contact you? Huge thanks to Richie for his time and helping return my emails for this interview. Also shout outs to his crew, video editor – Riley Hastings and composer – Mark Grisky. Speaking of their collaborations, here is one of their newer productions, “Sith Juggernaut.” At the end Hastings asks for your input. Take a minute and leave your comments. It is always great to get feedback, especially with all the work that is put into these videos and songs. Do you know someone helping the community? Or do you have links to artwork, music videos, game tips, etc. helping to showcase SWTOR? Please send these links to us here at Corellian Run Radio’s email, corellianrun@gmail.com. We will sort through them and shine the spotlight on members of this great community! GeorgZoeller Smuggler -> Cunning gear with shield rating? There’s some companions that may benefit from these items, but they’re certainly not optimal for you personally. 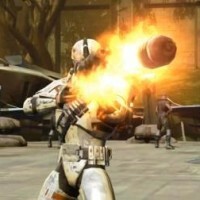 GeorgZoeller Smuggler -> More variety in end game gear, please! From patch 1.2, any orange (custom) appearance in the game will be viable for endgame purposes. Of course there’ll be new outfits as well – so these changes together should lead to a very significant amount of variation in endgame, for all classes. Speaking of mods and orange gear, Mike from TOR Hangout with another quick tip. This time he goes into how mods can be added and removed from that “orange quality” gear. This will be helpful, especially with news of new styles and types of orange gear coming in the next major content patch 1.2. Mike and the guys are not making the tip videos as frequent with the game going full bore and other responsibilities, but he has stated they will still be making a few videos here and there, so keep an eye out for those. GeorgZoeller Trooper -> 1.1.4 – Mortar Volley fix anytime soon? We have a new set of animations in the development pipeline that will even the timing between the class abilities, yes. As for timing, at the latest these new animations will roll out with the next major content patch, 1.2. JovethGonzalez PvP -> How Voidstar ties are determined. Answered! Unfortunately, it seems that our CS droids were in error when they responded to Ashania’s original tickets and for that, we apologize. Currently, in the event of a tie on Voidstar, the winner is randomly chosen. We are going to be improving this with 1.2, but in the meantime, that is how winners are currently chosen for ties on Voidstar. Again, I apologize for any confusion and thank you for letting us know about this. Quote: Originally Posted by Kjetl – Thank you, Joveth, for replying and confirming what’s going on. I hope Bioware will continue with this level of open communication in the future on all fronts. Wow, another whole month has almost passed by. Time does seem to fly. If you need a break to get your breath and catch up on some of the Corellian Run Radio articles, here is your chance. We have them listed below for your convenience. Please let our writers and podcasters know what you think by leaving a comment in their articles. 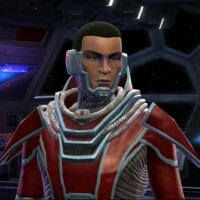 This week the “SWTOR Mayor,” Dimbo, has released another part (Taris part 11) in his ongoing story of “Dimbo the Trooper.” The new part has our hero, Dimbo, still on the planet Taris. I know that I have mentioned this fan fiction before, but Dimbo does a really great job of writing and keeps the story moving along. The best part it won’t take that long to read each part. The only downside is you will want to read more after each part. Here is a small excerpt from his new edition. Alten reached down and pulled out a plain white box and handed it to me. “What is it?” I asked and I set it down on the counter. I opened the box and inside were a pair of boots, similar to the ones I wore now. White military grade with a compartment for a small blaster on the right and a food and water ration in the other. These boots however had one small difference, attached to both boots were small sonic devices used to knock anyone in close radius to the wearer back. “I’ve heard about these boots, Alten, but no one had been able to get the blast radius right, do they work? “Of course, my good friend I tested them myself,” he replied. Would you like to see your favorite SWTOR fan fiction author highlighted or have links you would like to share with the SWTOR community please send them to us here at Corellian Run Radio and it might just get highlighted in future articles. You can email me at corellianrun@gmail.com, or you can leave link suggestions in the comments below, or in the Facebook group. See you all next week!